Based on project experience, research, and joint industry development work, DNV issues a number of pipeline codes. These comprise service specifications, standards and recommended practices, and are highly regarded within the international pipeline community. The DNV OS-F101 ‘Offshore Standard for Submarine Pipeline Systems’ provides acceptance criteria and design procedures for pipelines. The standard applies modern limit-state-design principles with ‘safety classes’ linked to consequences of failure. The DNV standard is complemented by several recommended practices (RPs), which give detailed advice on how to analyze specific technical aspects according to stated criteria. With the recent Chevron/Frade spill, which has been ongoing for over 25 days, new light was shed on the shortcomings of ANP (The national O&G regulator). To begin with the regulator has only spent around $2.5 million of its allotted $8 million budget for inspection of oil and gas E&P in Brazil. As stated by O Globo, Brazil’s leading newspaper, that amount is about what Petrobras spends yearly in coffee for its employees. Only 3% of the agencies total budged is destined for O&G inspections. All that will most likely change in the near future, hopefully. For this to change there needs to be a change of policy in the Brazilian government regarding the importance of O&G activities inspections. A major opportunity for new business and new joint ventures was the prime result of the 2012 edition of the Rio O&G. Brazil’s National Petroleum Organization (Onip) believes the event may have been a catalyst for R$ 152,8 million (US$76,4 million) in new business for the next twelve months. A study made by Onip with companies present and the Rio O&G 2012 showed that 84% of these companies expected to undertake some for of new business opportunities in the near future. A total of 13 foreign and 17 local O&G companies negotiated to form joint ventures in the industry, of these 13 expect to close a deal on new joint ventures in the near future. These include local companies and companies from Canada, U.S, England, Argentina, Italy and France. [No text]Even with the continued increase foreign O&G service companies opening shop in Brazil, local companies also begin to offer more specialized services that once had to be imported. In some instances, even competing very favorably with international companies, well established in the industry. OilFinder is one of these local companies and it offers services such as remote sensing and computational modeling solutions for Exploration and Production of O&G and also solutions for emergency situations in case of oil spills. OilFinder has already made an impact with its Inverse Modeling services, reportedly an exclusive and innovative technology that estimates the origin of oil seeps on the seafloor. Located hundreds and even thousands of meters deep, vast deposits of precious metals and other marketable minerals are closer to being explored. 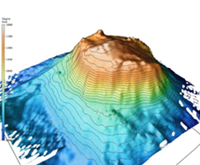 Advances in marine geology, hundreds of deposits containing gold, silver, cobalt, lead and zinc, valued at trillions of dollars, have already been identified under the seabed, usually around fumaroles (hot gas fountains of volcanic origin). These are spread out along more than 73 thousand kilometers of underwater fissures on the earth´s crust. This interest has already come to the attention of environmentalists and environmental organizations as these locations are usually populated by unique species that live along the borders of the fumaroles, due to the heads and chemical elements that emanate from these underwater chimneys. 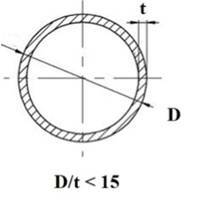 ATIVA is a Braziliam company that develops and provides innovative technologies in Subsea Engineering. It is one of the spinoffs of the Genensis Institute run by the Pontifical Catholic University of Rio de Janeiro (PUC). The Genesis Institute is an incubator for companies in the social, cultural and technological sectors. ATIVA develops solutions to the constant technological challenges encountered in deepwater O&G operations. The company has been a standout in developing ROV operated tools, designed for deepwater inspection and intervention, with an eye at competing for the many subsea field development contracts on offer in Brazil and abroad. Statoil recently increased the estimates for their Campos Basin pre-salt O&G discoveries up to a substantial total of 1.24 billion barrels boe. 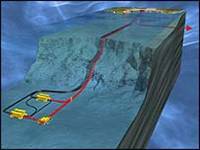 Consequently Statoil has also increased its optimism for the geologically similar plays it has in Angola. Not only are the cross ocean plays geologically similar but they are also located along the same longitude. Both pre-salt geological formations off the Brazilian and West African coasts have their origins in common, something that goes back around 120 million years ago, when ancient Gondwana split into what is now known as South America and Africa. The pre-salt reservoirs on both sides of the Atlantic Ocean are expected to contain large quantities of light oil. C&C entered the Brazilian market with its autonomous underwater vehicles (AUV) almost ten years ago. The company has had a steady growth in the country and now provides services that involve measurement of water properties, seabed topography, and seabed soil characterization. C&C uses their own vessels as platforms to launch their AUVs, covering the depth range from ultra shallow all the way to ultra deep 4500 meters and their clients use the data acquired by their AUVs to support their underwater infrastructure construction plans. 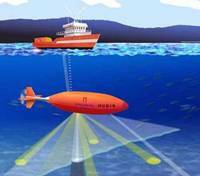 In Brazil the company has enlarged its scope of services on demand by clients after the success of their seafloor mapping technology using side scan sonars mounted on AUVs C&C is also undertaking extensive work in oceanography and environmental monitoring. Last Month the DOF Group named on the largest anchor handling tug vessel (AHT) ever built in Brazil, the Skandi Iguaçu. The vessel has over 32,000 BHP installed and bollard pull of more than 300 tons. Having been built at the STX OSV shipyard accros the bridge from the city of Rio de Janeiro, in Niteroi, the vessel will be ready for delivery to Petrobras three to five months in advance of contract requirement. Skandi Iguacu was ordered from STX OSV shipyard, with financing from the Brazilian Merchant Marine Fund through the BNDES (Brazilian Development Bank). The Skandi Iguaçu is part of a new generation of high powered anchor handling vessels, designed for operations across a wide range of deepwater depths and environmental conditions. As deepwater O&G discoveries abound up and down the coast in Brazil and as the early pre-salt discoveries begin to produce, along with other post-salt deepwater discoveries. All three main Basins; Campos, Santos and Espirito Santo are seeing a marked increase in pipe laying by all super major players involved in the development of deepwater plays in Brazil. There has also been an increase in custom deepwater pipe and flowline manufacturing and in the acquisition and leasing of pipelaying vessels for the Brazilian oil frontier. The newest order announced is for the supply of electrical power systems and energy efficient propulsion systems for two deepwater pipe laying vessels with the total order value being $18 million. Daewoo chose ABB to supply these systems. With a number of new O&G discoveries popping up nearly continuously in Brazil, both in shallow and deepwater, there has been a significant increase in ROV demand by operators, not only the major players but by all players involved on the Brazilian oil boom. In general the delivery of a complete ROV system may take around nine months, this includes the delivery of key equipment such as heavy duty winches, power and control umbilicals, flotation foam blocks, control modules, tooling kits and backup equipment. Here in Brazil, ROV manufacturers, which are basically all foreign companies with local offices, have been increasing their local stocks of ROV systems. The Alpha Crusis is a 64 meter (213feet) long and 11 meter (36 feet) wide research ship, capable of carrying up to 20 passengers, weighing 972 tons and with a 40 day sailing autonomy. 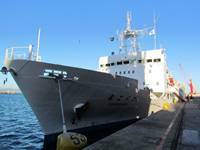 The research ship was bought by Fapesp (Foundation for the Support of Research of the State of São Paulo) from the University of Hawaii for use by the Oceanographic Institute of the University of São Paulo. The ships total cost including renovations ran at $11 million. When it belonged to the U of H, the ship was called the Moana Wave and was being run by NOAA until it was acquired by Brazilian Fapesp, after which it went through 10 months of renovations and refurbishing in a Seattle shipyard. The Rio Grande rise is located around 1,000 km from the Brazilian coast off the southern state of Rio Grande. This submerged mountain chain has its highest point located 580 meters below the surface of the ocean in a region where the mean depth is around 4,000 meters. The Rio Grande rise is the size of the Brazilian state of Bahia and is packed with a wide variety of marine life, many of which are unknown to scientists. During the expedition researchers noticed that there was a greater number of whales and seabirds close to the rise than in other offshore areas. The project´s official name is Mar-eco Atlântico Sul, and can be considered as a sea life census. The seabed oil spill that is still ongoing next to the Frade oil field in the Campos Basin is again raising the local awareness to the inherent dangers associated with O&G exploration. As many politicians and environmentalists hit the panic button, this kind of spill is, if not expected, is a definite possibility. There is simply no failsafe way to drill for oil and when the actual drilling is done underwater the risks compounded and the time it takes to resolve the issue is also increased. As this particular spill is a deep water event 1,200 meters deep it may not be so easy to stop and Chevron, the well operator has already taken steps to shut down the well permanently, this may also point to a loss of well control and a possible blowout. Since 2007, Petrobras, along with national research institutes and industry suppliers, has been busy researching physical, chemical, geological, biological and socio-economic characteristics of the Campos Basin, a region that starts at the north end of the State of Rio de Janeiro all the way to the south of the State of Espirito Santo, encompassing an area of some 100 thousand square kilometers. The project has two main parts, one about fisheries and its socio-economic impact and the other about environmental issues, which is called the Habitat Project. The information is being transformed into a database, which will be used to support decision making concerning environmental issues, environmental management and will also be edited as a scientific publication.